Left to right: Lebanese First Lady Mrs. Nadia El-Chami Aoun, LBCF vice president Mirna Sabbah Hoballah, Yasmeen El-Saghir, Dr. Nagi El-Saghir, and Rania Alameddine at a brunch celebrating International Women's Day and breast cancer awareness. Mrs. Aoun served as patron for the event. Organizers of the event, from left to right: Yasmeen El-Saghir, Dr. Sarah Daouk, Dr. Nagi El-Saghir, Zeinab Chahine, and Dr. Rita Saroufim. International Women's Day is a global day for celebrating the achievements of women on social, economic, cultural, and political levels worldwide. In 2017, the day’s theme was #BeBoldforChange. As much as this theme is about women calling for achievement of equality with men, one can also view it as a call for women to meet all kinds of challenges, including health challenges! 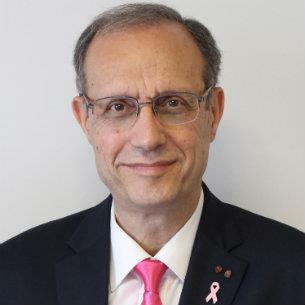 It is in that context that the Lebanese Breast Cancer Foundation (LBCF) and Breast Center of Excellence of the Naef K. Basile Cancer Institute (NKBCI) at the American University of Beirut Medical Center (AUBMC) decided to celebrate International Woman’s Day with a call for better access to breast health care, cancer screening, early detection, and better quality care. Paying attention to women's health, irrespective of resources, is another important challenge for full equality in society. The First Lady of Lebanon, HE Mrs. Nadia El-Chami Aoun, kindly accepted our invitation to serve as patron and to participate in a highly publicized awareness brunch. The event was given the theme “Ftahla Albak,” which is a Lebanese dialect proverb that means, “Open up your heart for her.” We recorded a video message from the President of Lebanon, HE Mr. Michel Aoun, whose mother died from breast cancer, calling on women to take care of themselves, asking men to stand by their wives and female relatives if they get sick, and promising support for better treatment that has become available in modern days. The President’s message was aired on all Lebanese TV and radio stations for 1 week around International Woman’s Day. Honoring women on International Women’s Day and calling for priority for women’s health care was highly appreciated. In a presentation given at the brunch, we explained the impact of awareness campaigns so far: reducing unnecessary fears, causing a decrease in advanced breast cancer at presentation, and improving the outcome of breast cancer in Lebanon. We explained that two-thirds of patients with breast cancer in Lebanon are now diagnosed at early stages, and that studies from AUBMC have shown that patients diagnosed at earlier stages have a very high chance of cure in more than 80% to 90% of cases. This high rate of survival is often being achieved without the need for total mastectomy or removal of all lymph nodes in the axilla, or even chemotherapy for slowly growing small tumors. This information was very encouraging to women and media disseminated it. We had support from the First Lady of Lebanon, the National Commission for Woman’s Affairs, and Minister of Health Mr. Ghassan Hasbani to transition from the current periodic awareness and screening campaigns to institutional methodology based at the Ministry of Health. Mohamad Sayegh, MD, Dean of the American University of Beirut Faculty of Medicine (@AUB_Lebanon), presented data on major infrastructure improvements at AUBMC; the University is now able to attract more physicians of Lebanese origin to return to Lebanon and contribute to improving health care, teaching, and research in our country. In addition to the First Lady and the Minister of Health, many public figures, dignitaries, physicians, breast cancer survivors, and volunteers played a great role in making this awareness and fundraising brunch event a huge success. Proceeds of the event are being used to help underprivileged patients with breast cancer receive treatment at AUBMC.